I’m beginning to grow my wine collection and I have some wines that I would like to enjoy immediately and some wines that I would like to age. Do I store these wines differently? Can they be stored in the same environment? What is the difference between short term and long term wine storage? How long you plan to store your wine will have an effect on which method of wine storage you use. Short term wine storage is usually defined by wine consumption within 6 months of purchasing. Wine bottles placed in short-term storage are wines that you wish to drink soon after purchasing or bottles you have removed from longer-term storage for easy accessibility. Even though you are not planning on long-term storing or aging with these wines, it is still important to store your wine in conditions which resemble those necessary for long-term storage so as to guarantee the quality of your wine. Ideal conditions will include storage within an environment where the temperature fluctuates as little as possible, and, ideally, the temperature hovers somewhere between 50°-59° Fahrenheit. While you are not necessarily aging these short-term wines, stable temperature is important to protect wine from premature aging caused by extreme temperature fluctuations. In addition, you will want this environment to be vibration-free and odorless. Furthermore, wine should always be stored on its side to ensure the cork is in constant contact with the wine and thus properly sealed. To create a consistent environment for wine storage and to control some of the factors we have already discussed such as humidity, temperature, and vibration exposure, wine cooler refrigerators are an excellent option for short-term wine storage. Budget-friendly and offered in convenient sizes, wine refrigerators keep your wines protected from vibration, store wine bottles on their sides so that the corks are in constant contact with the wine and stay moist, and your wines are in a safe, odor-free, environment. Learn About: Wine Serving Temperatures article). Long-term wine storage consists of wine you wish to store longer than 6 months. Some wine ends up in longer-term storage due to sheer quantity. Say you bought several cases of wine from a favorite winery during your last tour of Sonoma wine country. While you are not necessarily aging these bottles, you know that they will not all be consumed in 6 months. To store these wines you will want to place them in an area where their true flavor complexity will remain as delicious a year from now as it was when you first brought it home. Or maybe your long-term storage plans do include aging for years or even decades. If this is the case you will want to pay special attention to the conditions in which these bottles are housed. Perfect long-term wine storage conditions include a location that is dark with a low stable temperature, high in humidity and free of vibrations. While wine bottles are outfitted with ultraviolet protected glass, long-term exposure to light can still negatively affect your wine. In addition to dark environments, a low stable temperature somewhere between 50° to 55° is ideal for storage longer than 6 months. This range is the ideal temperature for preventing wine from spoiling and for it to age gracefully. If the temperature is too low, the wine will stay preserved but its growth and flavor will be stunted. If the temperature is too high, then the wine will age prematurely. If your location has a temperature that fluctuates between these two extremes, well then you’re really in trouble! An area of high humidity is also key for long-term storage. Somewhere around 70% or even higher is ideal for longer storage situations, as it keeps the corks from drying out and keeps evaporation problems at bay. Finally, a vibration-free environment must be offered for long-term wine preservation, since movement disturbs the wine’s aging process. So you don’t own a château in France with a cellar whose environment naturally satisfies all the requirements above? Don’t worry, few do! Today wine connoisseurs of all levels and of all budgets have the ability to recreate the perfect conditions for storing wine long term and in their own homes. Whether you live in Arizona where it is impossible to naturally achieve the ideal environment for long-term wine storage or you live in the Midwest where temperature may fluctuate from extremes of hot to cold, long-term wine storage is possible with either a wine cellar or wine refrigerator. Wine refrigerators are great options for people on a budget or people who have differing spatial needs. 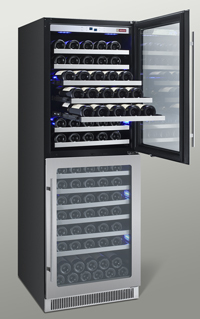 Just as wine refrigerators are ideal for short-term wine storage, they complement longer-term storage well as they offer the correct and stable temperature necessary for long-term storage with no vibrations, and they are outfitted with either solid doors or glass doors which have ultraviolet protection built-in. The only downside of wine refrigerators is their bottle capacity may not be large enough for some collectors, and many of the refrigerators are not equipped with the ideal humidity for long-term storing and aging. Wine cellars on the other hand, offer the absolute perfect environment for long-term wine storage and for aging wine for decades. With protective wood or glass, light is never a problem. Temperature is always kept to the ideal 50°-55°, and, perhaps most importantly, wine cellars will ensure the humidity within the unit is just right. Furthermore, they offer large wine bottle capacity and ample opportunity to expand your collection. Wine Long-Term, Short-Term, Storage, Wine. permalink.